Farnworth Local Board of Health was established in 1863. In 1898 the area of the Local Board became Farnworth Urban District Council. In 1939 Farnworth became a Municipal Borough, electing a Mayor each year. Badge presented to Past Mayor of Farnworth Municipal Borough Council. Badge presented to Past Mayoress of Farnworth Municipal Borough Council. In 1974 Farnworth became part of Bolton Metropolitan Borough. 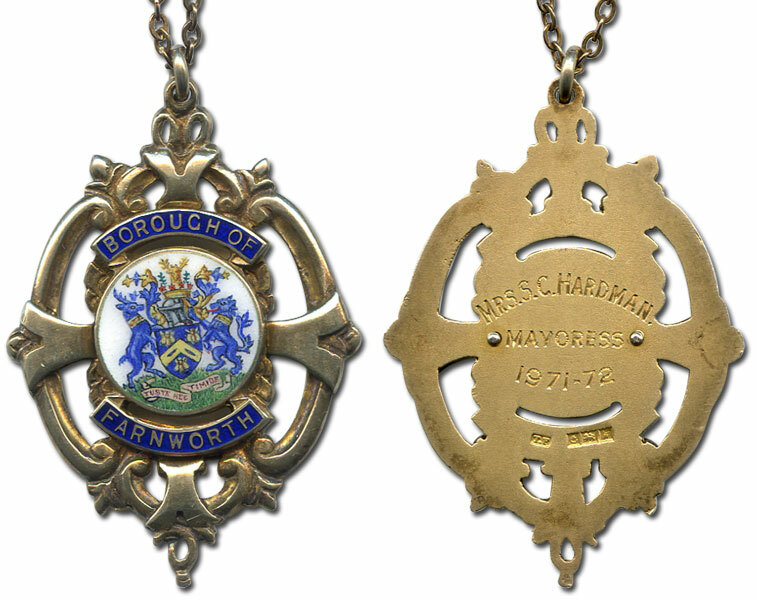 The Chairman's chain of office was presented to the Farnworth District Council at their meeting on 4 August 1914. William and Arthur Watson presented the Chain of Office to the Chairman for the time being, on their own behalf and their brother, Alfred Watson of Southport. William Watson remarked "that for 50 years the Chairman of Councils had run loose and they thought the present an opportune time to chain him up." They decided to present the chain to celebrate the Jubilee of the opening of Farnworth Park. The three brothers were the sons of Joseph Watson, a former member of the Local Board. William Watson was Chairman of the Finance Committee of Worsley Council. Alfred Watson had been a member of Farnworth Council but had had to leave when he moved to Southport. Arthur Watson was also elected to the Council but didn't take up his seat. In making the presentation to the Council they said that they were not sure they had a right to do so but their family were all connected with the Council and served in different ways. 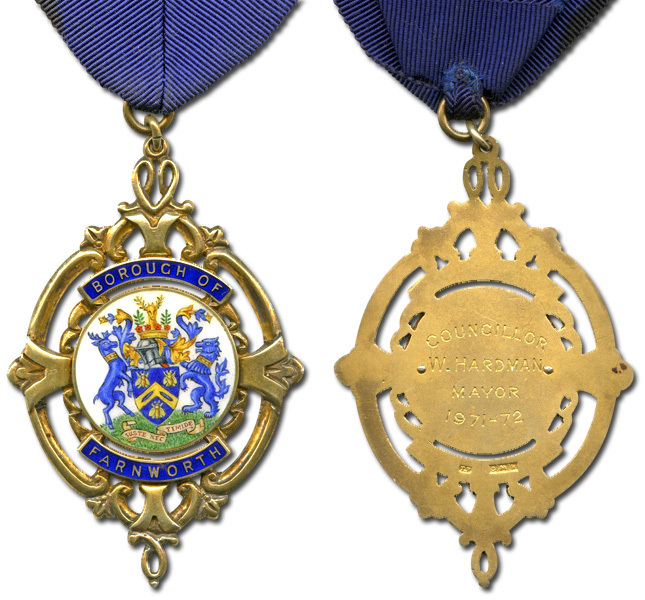 It was executed in solid wrought 9ct gold and consisted of ten medallions surrounded by richly modelled scrolls, connected by an equal number of rosettes artistically chased and symbolical of the Lancashire Rose, linked together by a hand wrought chain. From the middle hung a large badge, also in hand wrought gold, with the Farnworth coat of arms beautifully enamelled in 5 colours. On the reverse side of the latter was the inscription "Council's Jubilee 1913. Presented to Farnworth Urban District Council by William, Alfred and Arthur Watson. Park Jubilee 1914." William Boyes Richardson, Chairman, said he "believed he was right in saying it was inspired by the fact that at the recent Civic visit to the Parish Church there was some difficulty on the part of at least a few of those who witnessed it in distinguishing the Chairman."